Earn 200 Gold Points in My Nintendo! 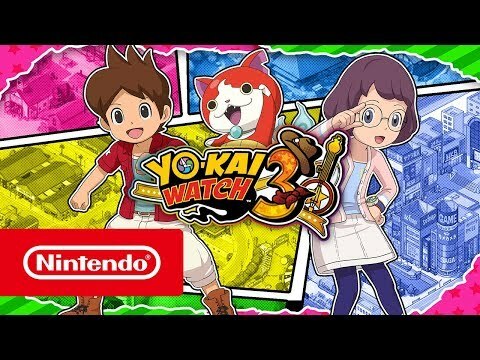 Mischievous beings known as Yo-kai are everywhere, and it’s up to Nate and Hailey Anne to befriend, battle, and solve problems with them in YO-KAI WATCH™ 3 for Nintendo 3DS family systems! Follow two parallel stories and unravel the mysteries behind strange sightings while meeting over 600 Yo-kai and using the new 3x3 grid battle system to strategically dish out or dodge attacks. More Yo-kai, more mysteries! ’Merican Yo-kai have made their way to YO-KAI WATCH™ 3 and they’re rootin’ tootin’ troublemakers. Speaking of troublemakers, in BBQ, zombies rise from their graves and Nate must free the town during Zombie Night. If you’re too afraid of zombies, you can always find treasure by exploring randomly generated dungeons and discover the truth about the mysterious ruins hidden all across the continent with the Yo-kai Blasters T group. Bonk zombies on the head, in an all-new mode, Zombie Night – it’s an invasion!